If We Never Face The Foe; The Game Is Already Lost! My assistant coach tapped me on the shoulder and said, “Your son is crying out on the mound.” I turned and looked out to see my eight year old son, my star pitcher; with baseball in hand and tears coming down his face. As the head coach I looked at the umpire and called time out and made my way to the mound. What would I say? It was the bottom of the last inning with two outs, and we were winning by one; but the other team had the bases loaded and arguably the best hitter in the league was at the plate. When I reached the mound I asked my son, ‘What’s the matter?’ With tears filled eyes he replied, “Mike is the best hitter in the league and I can’t get him out!” Without hesitation I reached out my hand and said, “Well, you better give me the ball because I need someone pitching who can!” In retrospect, perhaps I was caught up in the moment and I was too harsh for an eight-year old kid. But…something happened that moment that I have never forgotten. He looked up at me, and then at my outstretched hand. Then with moist eyes he confidently replied, “Dad, I can get him out!” With that, I dropped my outstretched hand, turned and walked back to the sidelines. Mike did rip the cover off the ball my son pitched to him. A bullet! But it was right at our shortstop and the game was over. The kids jumped up and down and celebrated the crucial victory for our team. It has been 30 years since then. 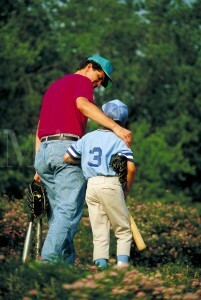 But both my son and I have never forgotten that conversation on the mound, and the resulting outcome. Perhaps, on occasion, we feel our Father above is insensitive to our situations in life. There we stand with tear stained cheeks and facing a tough batter at the plate. We want to somehow get out of that predicament. Surely a loving Father will bail us out we think! But then we hear His voice, and he calls on us to ‘buck up’ and conquer the foe before us. And we wonder if He cares! But of course He does! He leaves us to throw the ball in hand. Sometimes we win and sometimes we lose. Either way there are great lessons to be learned which build our character. But if we never face the foe, the game will already be lost; because we will never come out the victor, if we never pay the cost! « O My Son, Would God I Had Died For Thee!